April 7, 2016 – The Space Foundation has opened a new temporary exhibit called, “The Red Planet in 3D,” that allows visitors to experience and learn about MarsExpress, Europe’s first independent mission to another planet. Visitors will also learn about volcanism, water, ice, erosion, wind and tectonics – the six natural forces that have significantly formed Mars over billions of years. Since 2003, the MarsExpress has been orbiting the Red Planet to gain new insights into the geology, mineralogy and atmosphere of Mars. The main aim of the mission is to look for signs of water, which is believed to have covered large expanses of the planet’s surface in its early history. 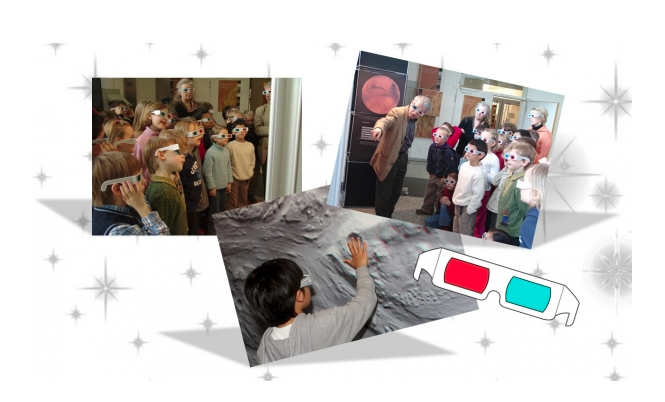 This 3D exhibition is an initiative of the German Space Agency of the DLR (Bonn) and has been funded by the Federal Ministry of Education and Research. The exhibit is included in the regular admission price to the Discovery Center and admission is currently free to military families with ID, through April 30. The DLR will remain at the Discovery Center through July 1, 2016. The Space Foundation Discovery Center is located at 4425 Arrowswest Drive, Colorado Springs, Colorado. Visit the museum website for operating hours and additional information.